A great and very cheap find at Weaverham boot sale. This may struggle to be regarded are a metal object,as only the safety pin can be classed as such...I love the simple layout needle cotton and buttons. A card of very tiny watch hands.Given to me by a friend whose dad mends watches (he once mended Buzz Aldrins watch that he wore to go the moon). The first hand is missing..perhaps it is on Buzz's watch right now! 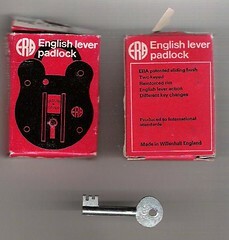 These padlocks were made in Willenhall in the Midlands. 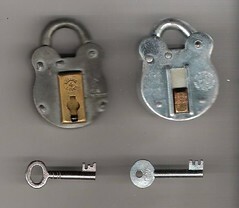 There is a wonderful museum in Willenhall of Padlocks..it was a small back yard industry there. You can see the rivets that hold them together. 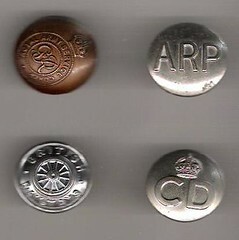 4 metal buttons found on the boot sale at Hartford. My dad was in the TA(Territorial Army) and they are very familiar objects. 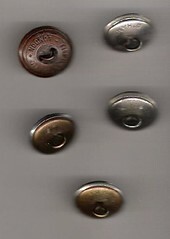 He also had a button polishing guard that I hope my mom still has.. If so I will include in on here. 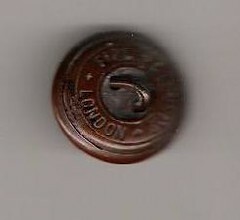 It was just a longish shaped piece of Brass that you slid under the buttons,thus avoiding getting polish on your uniform. Not the best scan of them, but you get the idea of the slight differences. I starting to realise as I collect these objects that the thing I like about them is the writing...where they are made, who by, and in some cases instructions. Objects that tell us things. 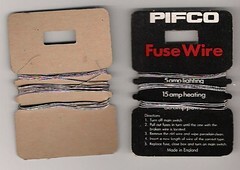 2.Pull out fuses in turn until one with broken wire is located. 3.Remove the old wire and wipe procelain clean. 4.Insert a new length of wire of the correct type. 5.Replace fuse, close box and turn on main switch. 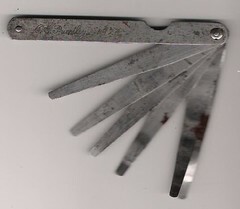 With thanks to Mark I now know this is called a "Feeler Gauge" and would have been used by a machinist or mechanic working on a machine with close tolerances. Mark used them in the Navy when working on pumps and valves to measure clearances on bushings - too big and they had to be replaced so the equipment didn't leak. Another object found on Moss Farm boot sale. On the same stall as I found the draughtsmans pins. 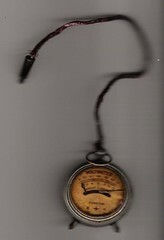 On the back it says..
1 over 1000 inch MOORE & WRIGHT No.132. 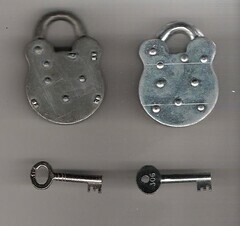 There are six thicknesses of metal. Who would have used one of these? This example of a Voltmetre isn't as good as the one sent by Sylvie. I found it on Crewe market,with its cracked glass and shabby wire. It does work and has a battered charm about it. A find from Moss Farm before the rain. 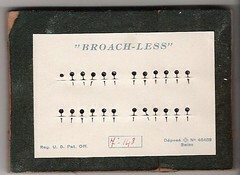 Four draughtsmans pins out of a small box of broken leads. 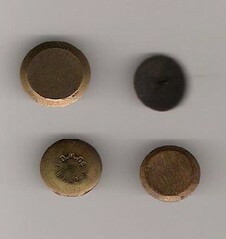 They are all made of brass and on some you can see the file marks. Only one has stamped on the front. A packet of pins I found on a stall at Moss Farm just as the rain started and the lady was throwing a plastic sheet over the table....snatched from the table just in time.. The pins are pushed into a series of 5 folds in the paper, forming a small book.